5 a.m. – a knock on the door. You respond quickly or the knock gets louder. If you’ve organized yourself the previously evening you dress quickly. If not, you fumble around sleepily for clothes, sunglasses and cameras. No time or need for makeup or hair styling. 5:20 a.m, – a quick cup of coffee on the Varty deck, before the ranger, Simon, gathers you up and sends you to the Land Rover. 5:30 a.m. – you’re off! Well, that’s after hoisting yourself into the Land Rover. 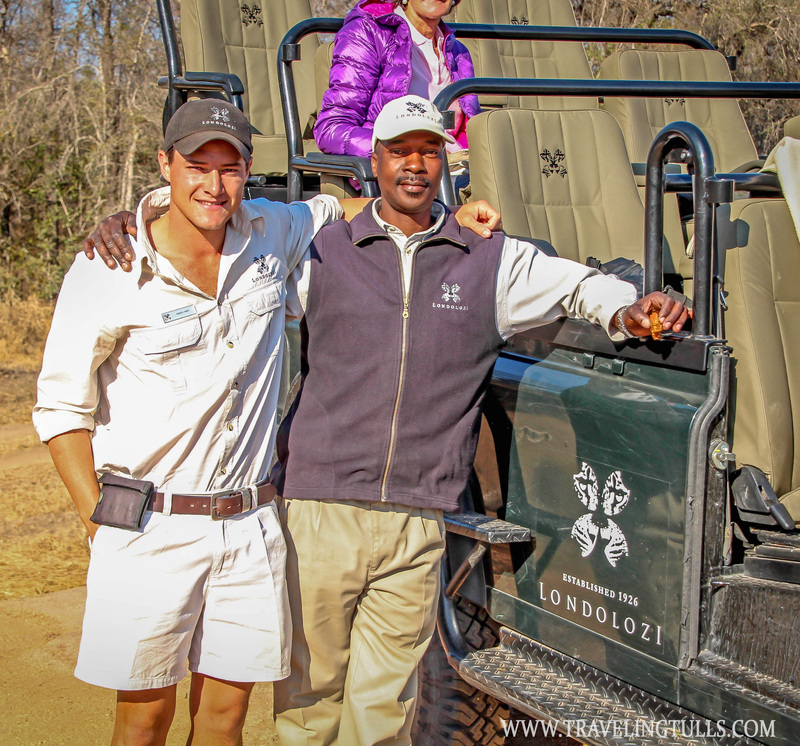 In Botswana and Zambia they supplied step stools, but Londolozi expects you to climb up the car into the seat. A nice stretch to start the day. It’s still quite cool but warm fleece blankets are on each seat of the vehicle. You wrap yourself up and prepare for whatever the day has in store. The roads are better in Londolozi than Zambia, and much better than Botswana, and the vehicle has good shocks, but you don’t always stay to the road. If Foster, the tracker, spots something or hears a warning call, you’re off across the bush. The trees in the area have inch long thorns so you keep your eyes open and duck often. The tracker sits in a seat at the front of the vehicle and indicates direction with just the turn of a hand. His eyes scan the ground, the bush and the trees as we move along. When an animal is spotted, we stop and turn off the engine so as to take a steady picture and enjoy the experience. It’s not a rushed experience… Unless a call comes over the radio that a big cat’s been seen. Then, the ranger tells you to hold on as he races across the reserve. It’s an exhilarating ride. At this camp the goal is to track animals, so you spend quite a bit of time searching for the elusive leopard. You begin to relax and review pictures on your camera when suddenly a flash of movement is seen and you’re alert. You’ll follow the animal through the brush, often with another car working in tandem, until the cat stalks a prey, takes a nap or melts unseen into the brush. 8:00 – the ranger finds a spot for a break. It might be an open field with antelope grazing, an overlook onto the river, or a rocky promontory. A table folds out from the grill-work of the car, the cooler is opened and coffee, tea, biscuits and amurula suddenly appear. 8:30 – the day is getting warmer, no need for blankets now. And consequently the game is getting “stupid” (as Simon says) You drive a bit more, watching the birds and smaller animals. You might stop at a watering hole to be surrounded by a herd of elephants. All the animals are indifferent to you. The leopard may glance at the vehicle, but only to see it as an annoyance in his path. The lions sleep contentedly within feet of you. 9:30 – back at camp you head to breakfast. It takes a bit to realize that it is breakfast as you’ve been up for hours. There’s a table on the deck waiting and the staff is quick to move an umbrella to give you shade. Breakfast is beautifully laid out on the buffet. A selection of meats, cheese, fruit, cereals and bread. But if that’s not enough you can order a hot breakfast. The day is now yours to enjoy. Londolozi offers classes from yoga to photography, but you’re free to lounge by the pool if that’s your wish. The staff is extremely attentive, offering opportunities to tour the village or the other camps if you’re interested. Only scheduled event is lunch at 1:30. 3:30 -tea time. This is the gathering time for the afternoon game drive, so come prepared with hats and cameras. 4:00 -afternoon drive. The rangers and trackers are intent in finding things on everyone’s checklist so this might be the time to look for lions, rhinos, or ellies. 6:00 or sunset – time for sundowners. Another great spot is chosen, the table reappears and cocktails are poured. It’s quite the civilized way to end the day. The last hour or so of the drive is done by searchlight. Not much can be seen but it’s fun to look for owls, etc. 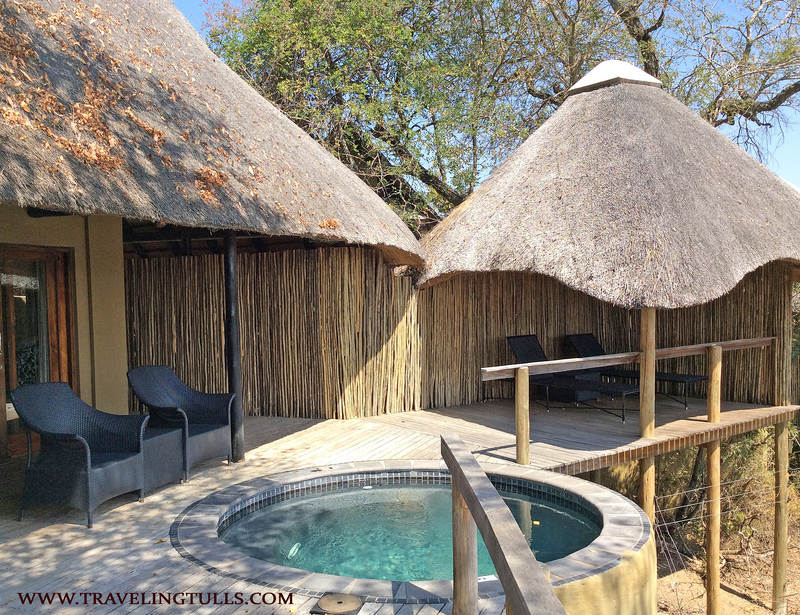 Posted on September 12, 2014 April 19, 2019 by TravelingTullsPosted in Africa, Journey African Safari, Luxury, South Africa, Travel StoriesTagged bucket list, dream destinations, leopard, Londolozi, luxury travel, safari, safari camps, wildlife.